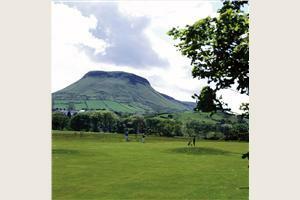 Founded in 1937, this picturesque 9 hole golf course is bounded by the quaint village of Cushendall and the waves of Red Bay and nestles at the foot of stunning Glenballyeamon in the celebrated Glens of Antrim. The River Dall meanders through the course to the sea and it is due to its presence that the course owes its “tricky” reputation. Its murmuring waters create out of bounds at the first five holes and reappear with a vengeance at the last two, making any wayward shot almost sure to find a watery grave. The clubhouse on Cushendall beach enjoys spectacular views across the sea of Moyle to the Mull of Kintyre on the Scottish coast which is just over 20 miles away.